Next10 Foods on your Goa Foodie Bucket List! Pet Cafes in India: Take Your Furry Friend for a Pet’s Day Out! For every single time you have had to leave your pet at the door of your house, there is now a reason not to be so upset anymore. Going out to hang out with friends or spend some time off, no longer has to mean bidding adieu to your eager pet who looks at you longingly every time you leave! If you have a dog or a cat, several options have cropped up across the country to enjoy a relaxing time together with other animal lovers. Behold pet cafes that open up the world to both humans and furry creatures and understand the special bond between a person and his/her pet. Also, if the only time you get to spend with your pet is for a walk in the evening, this is a wonderful opportunity to socialise and meet like minded people with love for canine creatures. The first dog cafe in New Delhi, this quaint little cafe in Shahpur Jat is also a co working space! Every day is literally Bring-Your-Dog-to-Work Day! They have separate menus for humans and dogs and the dogs even get their own dedicated space to play and roll around. With special food for dogs that comes in beautiful colours, shapes and innovative designs. They have doggy pizzas and pancakes for God’s sake! It’s hard to imagine how anyone manages to stick to work here. But one thing is for sure, work has never been so stress free and hanging out with your BFF has never been this easy. Get ready to be greeted by the cutest, happiest and friendliest labrador, Apple as soon as you walk in. 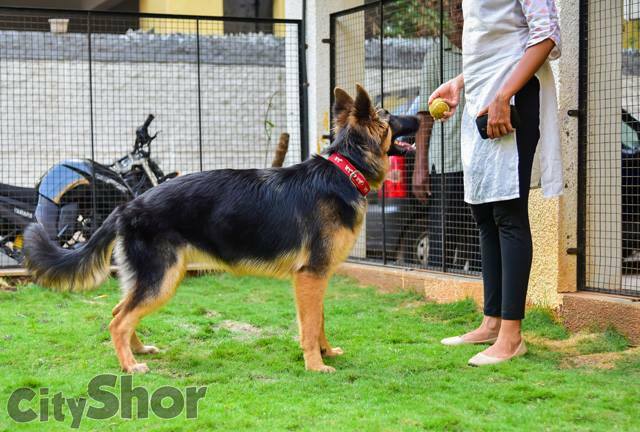 Aparna Gwalani, the owner, is a dog lover herself and has two dogs- Apple and Chickoo. With her passion for dogs, she continues the enthusiasm to unite other humans with their pet dogs in a leisurely relaxed environment. With a separate menu for humans and their dogs, Gostana caters to both needs with healthy, delicious choices. Their burgers we hear, are quite a novelty! Started by two sisters Trupti and Bhakti, this playhouse is a lively place for dogs to bring their game on. This pop-up cafe definitely knows where its priorities lie, “Even humans are allowed” is their tagline. From doggie dates, grooming sessions and even camps- they host a variety of events and seem to be quite the one-stop for dogs and their hoomans! I say, this should be on your ‘things to do in life’ list even if you don’t have a pet! Is it a park? Is it a cafe? Combining the best of both indoor and outdoor worlds, this place is perfect for a day out or even an entire weekend. For both humans and dogs! Complete with a swimming pool, games, team activities and scrumptious food- who says hanging out with your pooch only means playing fetch? Like the name itself suggests, this quaint cafe is a perfect place to hang out for both the bipeds and four-legged. With a huge welcoming lawn, special menus for the pets and the option to dine in or out in the open, this place has become a remarkable site to get away from the hustle of the city. Founded by a couple- Gauri and Vijendra Suryawanshi, they combine their love for animals and passion for food to bring together a relaxing environment for like-minded people. They also provide day care and home boarding facilities for a limited number of pets! First started in Taiwan, cat cafes are now a rage in Japan, Thailand, Taipei and several other countries. If you thought cats only rules Instagram and the internet with the grumpy, adorable antics- think again. These cat cafes are taking the real world by a storm and why not! Home to several kittens and cats, anyone can enter with a cover charge and play with the cats. All the cats are also up for adoption if anyone is interested. In an attempt to make the world a little safer for our four-legged friends, cat cafes and the like are incredible opportunities to mingle, understand and spread awareness. Read here how you be inadvertently hurting wildlife around you. Luckily in India, we have a few of these amazing options. House No 68 in Aram Nagar has a cat cafe inside a film production house that doubles up as a home for cats that are up for adoption. At any point of time, there may be as many as 15 cats and they even have a puppy at the moment. But this place is different from the conceptual system of cat cafes since one can go in to simply play with the cats absolutely free. They have been involved with rescue missions right from the inception of the company and Zcypher Studios spends about 12%-15% of its profits on maintaining these adorable creatures. As a workplace, it’s easy to spot cats sitting on laptops or playing with headphones and they even arrange animal care awareness programs for the locals. We have excluded restaurants that allow owners to sit on the porch outside with their dogs or insist on a leash, in this list. The idea is to have fun, socialise, meet new animal lovers and share the enthusiasm and these cafes in India seem to strive for just that. Have we missed out on pet cafes in India? Do you have suggestions for cat cafes and would you go to one in your locality? Let us know! As an animal lover, we also recommend you to check out how to volunteer for a wild life sanctuary and get to know animals in their natural habitat.